On 1 April 2016 we launched the Level 3 Diploma for Health Screeners. 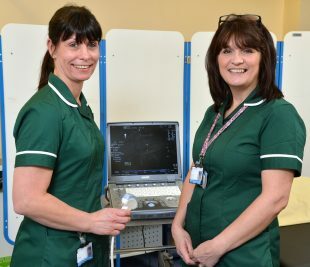 This new national qualification is now a requirement for non-professionally regulated staff working in abdominal aortic aneurysm (AAA) and diabetic eye screening (DES). It will also be mandatory for staff within the newborn hearing screening programme (NHSP) from April 2017. We developed the diploma with Health Education England and Skills for Health. As a nationally recognised qualification, it can be used to support career progression of staff in the 3 screening programmes. It’s important for local programmes to know how to register new learners on the qualification. There are 2 options and this is a local decision. 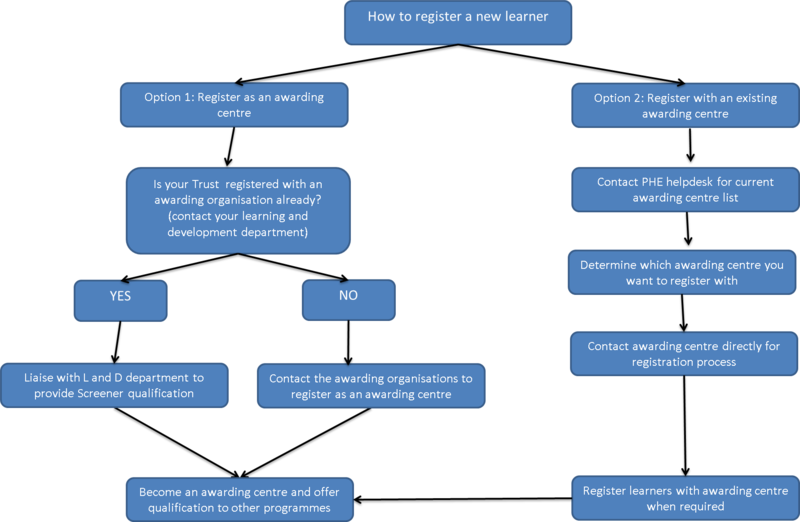 See the information and flow chart below to help you decide the best option for your programme. You can register with 1 of the 4 awarding organisations. This means you can then provide the qualification for your staff and also offer it to other local screening programmes across the country. Approved awarding centres are the administrative hubs for the qualification. They are responsible for the oversight, administration and registration of assessors and learners. They are also responsible for the quality assurance of the provision of the qualification in local programmes. Awarding centres determine how much they charge to cover the associated costs of providing the qualification. Registered awarding centres must have appropriate administrative capacity and associated quality control processes to provide the qualification. If you want to choose this option you should first contact your learning and development department to find out if your trust / private provider is currently an awarding centre with 1 of the 4 awarding organisations. If so, they will be able to help you provide the qualification locally. If not, then please see the list of awarding organisations and their contact details. Registered awarding centres can offer the qualification for 1 or more of the 3 national programmes that need to undertake the Level 3 Diploma. A list of registered awarding centres providing the qualification in England is available from the PHE Screening helpdesk. You then decide which awarding centre to register with and contact them directly. New learners and assessors need to register with the chosen awarding centre. More information about the screener qualification, awarding organisations, assessor qualification, funding and assessment methods is on the PHE Screening CPD website. Skills for Health has produced a frequently asked questions document and also a leaflet for employers.